Thomasson: "It's outrageous for Antonio Villaraigosa's billionaire backers to push distortions and falsehoods upon conservative, Republican voters"
SaveCalifornia.com provides this solely for educational purposes and does not support or oppose candidates for public office. Sacramento, California (May 25, 2018) -- In several recent mailers to California Republican voters, Michael Bloomberg and other liberal, billionaire backers of Democrat Antonio Villaraigosa's bid for governor have engaged in blatant distortions to deceive voters. SaveCalifornia.com, which does not support or oppose candidates, calls for fair elections by urging voters to not trust the falsehoods and distortions of "Families & Teachers for Antonio Villaraigosa for Governor 2018, sponsored by California Charter Schools Association Advocates." "It's obvious that Michael Bloomberg and the other liberal billionaires backing Villaraigosa will say and do anything to peel away votes from John Cox, who polls confirm is the Republican frontrunner for governor," said Randy Thomasson, president of SaveCalifornia.com, a longtime California family values organization. "Their true intent is to guarantee that Democrats continue to totally control California state government, and more crucially, regain control of the U.S. House and reinstall Nancy Pelosi as their Speaker. Their deceitful mailers and robocalls aim to ensure that two Democrats for governor will be on the November ballot, Antonio Villaraigosa and Gavin Newsom." "We need fair and honest elections, so it's outrageous for Antonio Villaraigosa's billionaire backers to push distortions and falsehoods upon conservative, Republican voters," Thomasson added. "In addition to leading Villaraigosa in the polls, John Cox embraces many conservative policies that appeal to Republican voters. In their attempt to defeat John Cox, Michael Bloomberg and the other liberal billionaire backers of Villaraigosa have shown themselves to be masters of deceit and slander." What's true and what's deceitful here? The mailers to Republican households disclose in small, legal print that they are "Paid for by Families & Teachers for Antonio Villaraigosa for Governor 2018, sponsored by California Charter Schools Association Advocates. Committee major funding from Reed Hastings, Eli Broad, Michael Bloomberg." 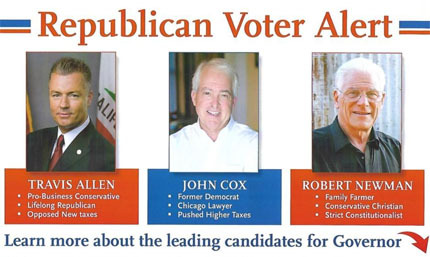 The mailer placed the leading Republican (John Cox) with a blue box underneath him (falsely implying that he's a Democrat candidate); the two trailing Republicans (Travis Allen and Robert Newman) received red boxes (emphasizing that they're Republicans). Yet in the California governor's race, Cox, a longtime Republican, has consistently led the others. 2. Labeling John Cox "a former Democrat"
Yes, John Cox grew up in a Democrat household, but became a conservative Republican several decades ago. Ronald Reagan, Donald Trump, and many other Republican leaders in the U.S. were also former Democrats. Today, John Cox is the leading Republican candidate for California governor. 3. Calling John Cox "a Chicago lawyer"
Yes, John Cox was born in Chicago and has a law degree. He founded a successful real estate and investment counseling company. Cox and his family have been California residents since 2011. This labeling by Michael Bloomberg and the other liberal billionaires backing Villaraigosa is sleazy. 4. Claiming John Cox has "pushed higher taxes"
John Cox has been a top leader to qualify for the November 2018 ballot the repeal of last year's gas tax and DMV fee increases. An opponent of higher taxes, John Cox wants to completely eliminate California's state income tax to make California competitive with states with no income tax, such as Texas and Florida. "If Californians want to vote with integrity, they can't trust the deceitful mailers and phone calls they receive," Thomasson concluded. "Before people vote, we invite them to do their homework with the help of SaveCalifornia.com's Election Center."